Wikipedia, used my billion of people on daily basis, keep on incorporating news features for ease of its users. This time Wikipedia has added the most useful feature named Page previews. According to Wikimedia foundation “Page Previews” is the most prominent change made in recent years to desktop Wikipedia. Page previews will not allow users to have some additional information of the article behind the link. The new exploration is fun filled activity. When you would be gathering information through any Wikipedia page, you will see a rabbit hole that can take you to more deep places/ pages that you wouldn’t have even expected. However it will be distraction for many people as well but for others it will build more interest to gather more information on the related topic. The latest Page Preview option, shows an image along with different sentences that tells more about your article when you hover the mouse on the link. In this way you will get more information of your context and it will be up-to you whether you want to know more about it or not. If you decide to gather some more information, you need to click on the link, which will open a pop up menu that takes you to the article in question. If you are done, by moving the mouse away will vanish it. 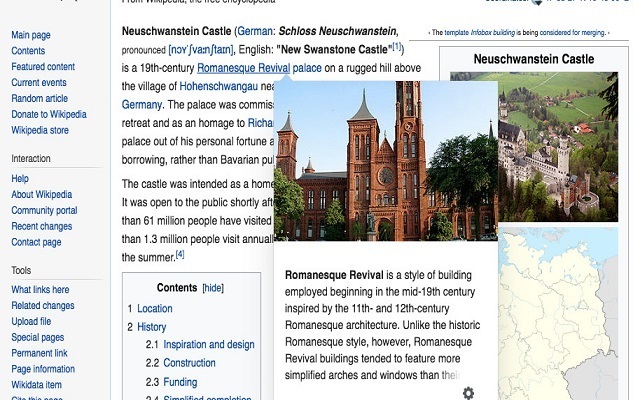 According to Wikimedia, to develop this feature, they did extensive A/B testing and came to know that people are not disabling this feature which means they actually found it useful. Each reader is interacting with the content of more pages while navigating the site and that the site’s overall page views have gone down as a result. It means that people are loving this feature as this feature allows user to gain more and more information by remaining on less number of pages.